Do you suffer from chronic headaches? Chiropractic can help! If you suffer from chronic headaches, you are not alone. Chiropractic treatments can help keep you medicine- and headache-free for the long-term. Doctors of chiropractic practice a hands-on, drug-free approach to health care and pain relief that includes patient examination, diagnosis and treatment. In addition to their expertise in spinal manipulation, chiropractors have broad diagnostic skills and are trained to recommend therapeutic and rehabilitative exercises, and to provide nutritional, dietary and lifestyle counseling. 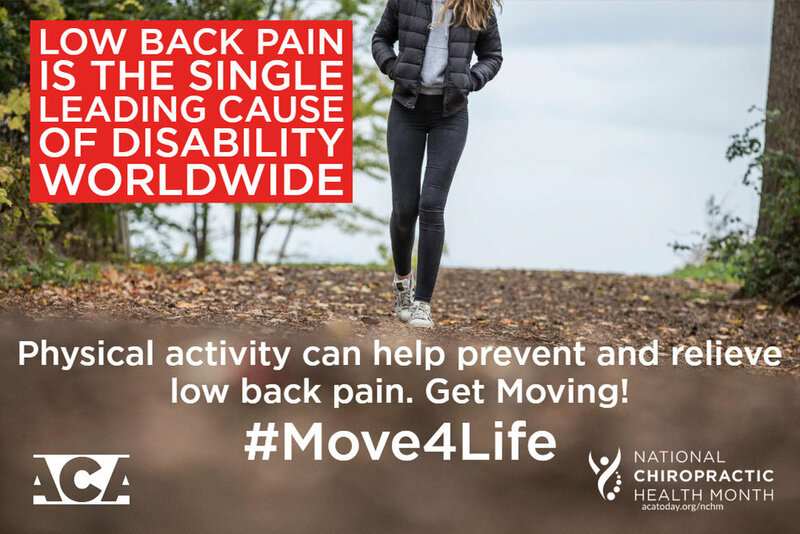 For information on the benefits of movement and tips on how to stay active and prevent injury, look for the hashtag #Move4Life on our Instagram, Twitter, and Facebook pages, and elsewhere on social media. We all know we should be drinking water since our bodies are made up of over 70% of it. But did you know that it's important to drink water after your chiropractic, massage, or acupuncture treatment? A chiropractic treatment puts your body back into alignment and releases tension that's been held for a while. As a result some toxins and nutrients that were held are also released. Drinking water helps to flush those items through to your kidneys and liver to help remove the toxins from your body. A massage is a way of working your muscles; not dissimilar to a workout. The therapist is working on your muscles, stretching and manipulating them so there may be delayed soreness. Drinking water prevents dehydration of the muscles as they are using fluids to rejuvenate. Did you know that sleeping can effect your joint health? You can take the strain off of your back just by switching your sleeping position. Side sleeping is the healthiest position with a pillow between your legs to help alignment. Many people find that a body pillow is more practical for sleeping like this. Sleeping on your back can put strain on your lumbar region so placing a pillow under your knees can help relieve that. You can also place a small, rolled up towel under your lumbar spine for added support. Sleeping on your stomach creates the most strain on your back. If you cannot sleep in any other position, you can put a pillow under your lower abdomen and pelvis to help alleviate strain. Pregnant women should avoid sleeping on their backs as this can cause backaches as well as other health concerns. A sleeping bean pillow is designed to help pregnant women sleep more comfortably on their side. You can read more from the ACA. Low back pain is a common issue. Your chiropractor can help. Check out this article, Where to turn for low back pain relief, by Harvard Health. Suffering from Tech Neck? Check out this video for tips on a healthy spine.